It's not uncommon for ISPs to offer a modem with a Wi-Fi router built into it. They're convenient for cutting down on clutter, but that convenience sometimes comes at the expense of wireless coverage. 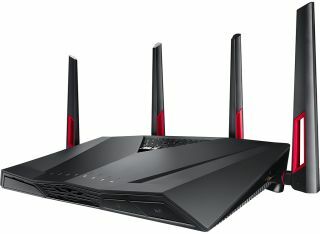 Asus doesn't think that will be a problem with its new DSL-AC88U, the company's fastest modem-router to date. The DSL-AC88U combines a DSL modem that is compatible with the G.fast standard as well as existing ADSL, ADSL2/2+, and VDSL2 standards, with an AC3100 dual-band Wi-Fi modem. It supports data rates of up 2,167Mbps on the 5GHz band and 1,000Mbps on the 2.4GHz band, hence the AC3100 designation (router makers often add together the total data rate available across all bands even though they can't be combined into a single super-fast connection, and then round up or down). "Asus DSL-AC88U uses a Broadcom NitroQAM (1024-QAM) technology to boost maximum Wi-Fi speeds on both the 5GHz and 2.4GHz frequency bands by up to 25 percent compared to other four-stream (4x4) MIMO designs," Asus says. "With NitroQAM, 5GHz speeds can be improved from 1734Mbps to 2167Mbps, and at 2.4GHz speeds are boosted from 800Mbps to 1000Mbps. This gives DSL-AC88U a combined total bandwidth of up to 3167Mbps for lag-free, low-latency online gaming, smooth streaming of 4K UHD movies and blindingly-fast file-sharing." On the modem side, support for the G.fast DSL protocol offers a bit of future-proofing. G.fast DSL enables broadband speeds up to 18x faster than VSDL2, or 4.5X faster than Vplus. None of that will do you any good (on the modem side) if you're subscribed to a cable broadband service. However, the DSL-AC88U does have a WAN port for connecting to your fiber or cable box. The DSL-AC88U also features four GbE LAN ports (pretty standard on today's Wi-Fi routers), along with USB 3.0 and 2.0 ports (one each) for connecting printers and external storage devices. Asus says the DSL-AC88U will be available starting the first week of March for $279 (€259).